It’s the end of an era in downtown Fresno. After years of hard fought battles over the fate of the Fulton Mall, demolition is underway. Dozens turned out for an official ground breaking on a project to pull out the six-block pedestrian walking mall in downtown Fresno and turn it back into a street. Music blared and Fresno Fuego fans banged drums to celebrate what many see as a new chapter in the history of downtown Fresno. 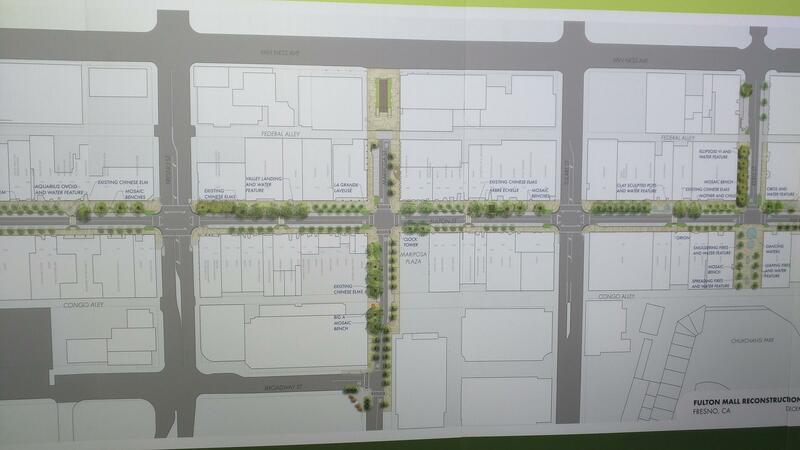 The vision of supporters is to revive the downtown corridor by opening up the corridor to vehicle traffic. 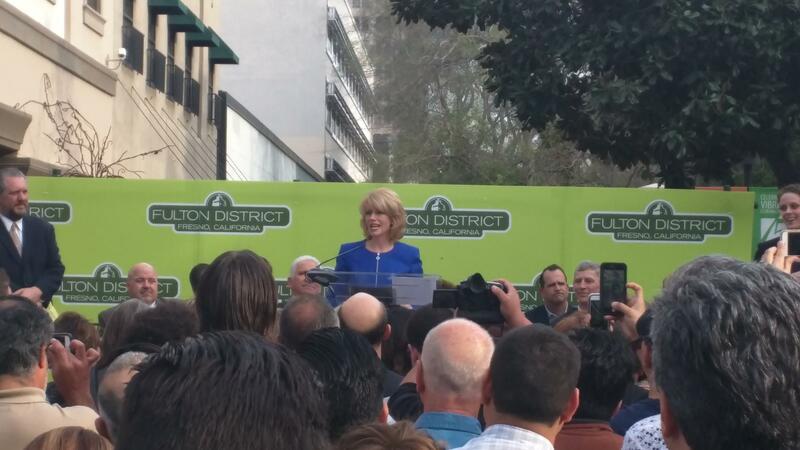 One of the project’s main champions is Fresno Mayor Ashley Swearengin, who took to the podium on a stage at the north end of the mall to celebrate the project. “Today marks Fresno’s turn towards optimism, hope, and a belief that when we work together with purpose and focus we can build a city that we know future generations of Fresnans will enjoy and cherish,” Swearengin said. Numerous local leaders attended the ground breaking including city council members and Congressman Jim Costa. A large portion of the $20-million dollar project is funded by federal dollars. 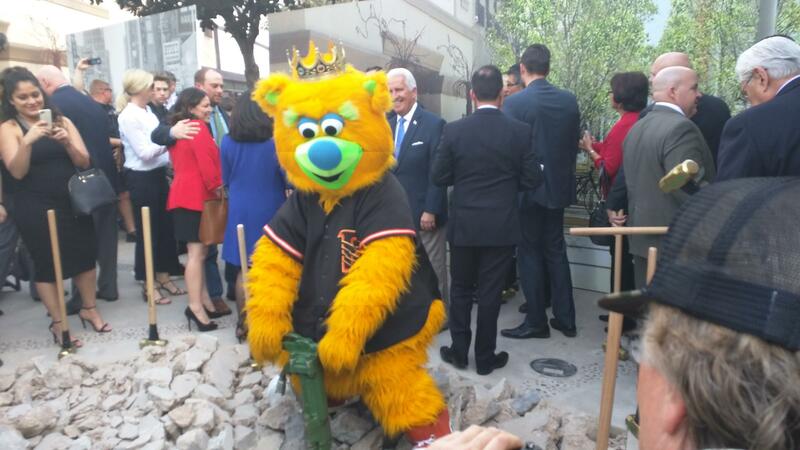 In front of a 25 foot picture of the original mall ground breaking, leaders swung gold painted sledgehammers into the concrete. They then rolled the picture away to reveal an artist’s rendering of what they envision Fulton Street will look like. Brian Washington owns a small restaurant on the mall. He is excited for the future and thinks it means he can expand the hours and hire more workers. Some people grabbed pieces of broken concrete as souvenirs from the ground breaking. A number of people in the crowd recalled being at the original groundbreaking 52 years ago this month. It is expected to take a little more than a year to completely remove the mall. The plan is to also remove, restore, and reinstall the multimillion dollar public art that is currently on display. Opponents of the plan fought hard to stop it including filing multiple lawsuits and turning out in force at city council meetings. Doug Richert with the Downtown Fresno Coalition, the main opposition group, continues to hold out hope that the construction can be halted. However, he also looked at the potential upside of the project. “There is hope that some of this long neglected art will get some attention and bring it back to the condition that it deserves,” Richert said. Richert said they are still looking to the courts to stop the mall project but acknowledged that it is a long shot.